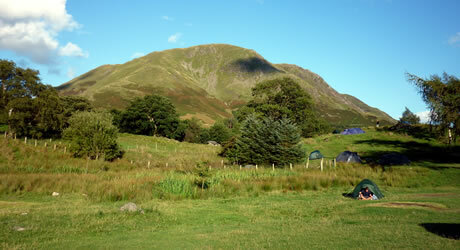 Syke Farm Campsite in Buttermere is a peaceful, special place due to its exceptionally scenic location. It lies next to a stream and is surrounded by the majestic Lakeland Fells. It is a basic campsite consisting of a slightly hilly field with some flat areas as well, and the facilities comprise of just two simple toilet/ shower blocks (one for men and one for women). To reach the field you have to park your car in the car park and carry your gear across a small wooden bridge. If you don't mind this and you like simple campsites then this one is definitely worth a stay purely for its beautiful location and tranquillity. Syke Farm campsite is just a couple of minutes' walk from two pubs, the Fish Hotel and the Bridge Hotel, and a cafe, so is great for an evening drink and short stroll back to your tent. We tried both pubs and found them both decent places for food or refreshments. In good weather the campsite's location is stunning and you could sit happily for hours admiring the spectacular views whilst listening to the bubbling stream. In more unsettled weather the wind and rain can really blow down the valley and it can seem quite a different place so check the weather forecast or just take a chance as we did. Walks for all levels can be accessed easily from the campsite such as a gentle walk around Buttermere Lake or Crummock Water, or for keener walkers there are longer, more challenging walks including the ascent of nearby Haystacks. This entry was posted on Friday May 20th, 2011 at 5:00 PM and is filed under Places to Stay.You can follow any responses to this entry through the RSS 2.0 feed. You can leave a response.